Die Nadeln kosten einzeln 2,50 Euro | 10 Stück 20,00 Euro - jeweils zuzüglich Versand. 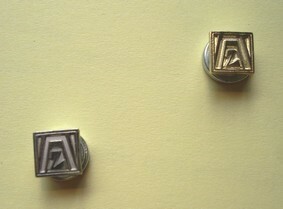 One pin costs 2,50 € or 4 US $, 10 pins cost 20,00 € or 32 US $, in each case plus mailing expenses. Immediately deliverable also in large numbers of pieces/orders! The proportion of donation goes to ZONTA International Foundation.